Kwiatkowski, L., B. Gaylord, T. Hill, J. Hosfelt, K. J. Kroeker, Y. Nebuchina, A. Ninokawa, A. Russell, E. B. Rivest, M. Sesboüé & K. Caldeira, 2016: Nighttime dissolution in a temperate coastal ocean ecosystem increases under acidification. Scientific Reports, doi: 10.1038/srep22984. 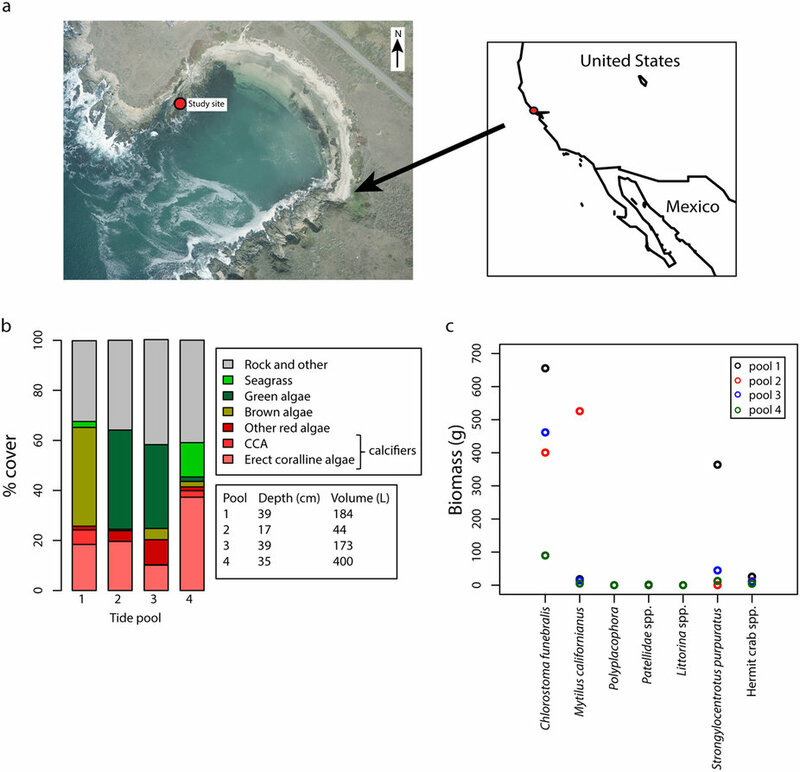 Anthropogenic emissions of carbon dioxide (CO2) are causing ocean acidification, lowering seawater aragonite (CaCO3) saturation state (Ωarag), with potentially substantial impacts on marine ecosystems over the 21st Century. Calcifying organisms have exhibited reduced calcification under lower saturation state conditions in aquaria. However, the in situ sensitivity of calcifying ecosystems to future ocean acidification remains unknown. Here we assess the community level sensitivity of calcification to local CO2-induced acidification caused by natural respiration in an unperturbed, biodiverse, temperate intertidal ecosystem. We find that on hourly timescales nighttime community calcification is strongly influenced by Ωarag, with greater net calcium carbonate dissolution under more acidic conditions. Daytime calcification however, is not detectably affected by Ωarag. If the short-term sensitivity of community calcification to Ωarag is representative of the long-term sensitivity to ocean acidification, nighttime dissolution in these intertidal ecosystems could more than double by 2050, with significant ecological and economic consequences. Figure 1. Study site characterisation. (a) An aerial photo of Horseshoe Cove, Bodega Marine Reserve, California and the location of the tide pool study site on the Northern California coast (38.3°N, 123.1°W), (b) the mean depth, volume and primary producer community cover and (c) the invertebrate community in each of the tide pools. The map is produced using R version 3.0.3 software (https://www.r-project.org/). Figure 4. Nighttime community calcification and Ωarag sensitivities/projections. (a) Nighttime Gnet (mmol C−1 m−2 h−1) against aragonite saturation state (Ωarag) in each of the tide pools. Regression lines are significant at the p < 0.05 level. 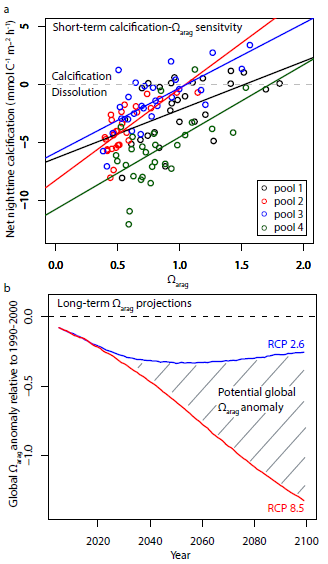 (b) Coupled Model Intercomparison Project Phase 5 (CMIP5) global Ωarag anomalies relative to 1990–2000 mean values for the Representative Concentration Pathways 2.6 (RCP 2.6; blue) and 8.5 (RCP 8.5; red). Ωarag anomalies are multimodel ensemble mean values calculated from 8 CMIP5 models with fully coupled ocean biogeochemistry schemes. RCP 2.6 and RCP 8.5 respectively represent the most extreme mitigation and business-as-usual RCP scenarios conducted in CMIP5.